Equity Danes/Black Raven Kennels (Dobes) returns 12/14/2016!!! Bronze GCH and Bronze Sire. Equity Danes is not only a kennel playing on this game, but also a real AKC exhibitor of Harlequin Great Danes. Equity is striving to breed the BEST Harlequin Great Danes possible. If you see a dog that is of age but not available, please email me as I may not have checked stud status. Can. Ch. 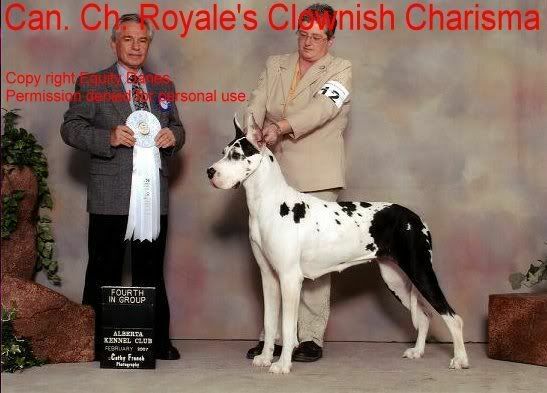 Royale's Clownish Charisma, owned by Equity Danes and handled by Lynn Knapp. Deceased. Photos have their source on the bottom. Clipart graphics are used/altered with permission by www.aheadgraphics.com and I am the one who colors them/adds detail to them. DO NOT STEAL/USE THESE CLIPART IMAGES without permission from aheadgraphics.com! Great Dane photos are of my own show dogs. They are NOT for personal use and are copy righted in my name.